Two local derbies brought positive results for the high-flyers in Division One as the pressure mounts at the top. Tile Hill Trojans 1 beat their second string with the utmost of ease, with Trojans 2 having their evening ruined as three of their squad cried off with work calls, and the two potential replacements from the Third team were both nursing nasty finger injuries. But the remaining seven turned out and had the temerity to go ahead in what was a sluggish start by both teams. However, once the league leaders managed to get going they tore into their seconds and led 39-10 just after the initial quarter had finished, going on to pressure their colleagues, steal or intercept passes and race to the other end to cash in. Leading the way was Mark Larner who took the ball time and again from inside his own half before driving through to land some sublime points for the Firsts. He went on to record 27 with Austin Dickson adding 15 and 12 coming from Seconds’ Bhuwan Limbu as his side floundered. Despite being short on their team-bench Hawks proved too good for plucky JM Grizzlies who were once both part of the oldest club in the Warwickshire Basketball League. Grizzlies were planning to spend a season in Division Two but went up as part of a league reorganisation and have struggled throughout the season. They came good against their former parent club though and led 18-17 after the first period. Hawks edged ahead in the second, which brought little for the scorer to inscribe, and as the game moved into the second-half scoring was still something of a rarity. Hawks the initiative though to lead 51-36, when Harry Adaway brought Grizzlies offensive play to life. He added three three-pointers to make it six in the game and as Grizzlies reduced the margin to ten, but it was too little too late for what would have been a sensational ending. Ricky Fennell led Hawks with 26, one more than Calvin Moore while Adaway’s 24 was some consolation for Grizzlies. Arden Griffins faced a proverbial “banana-skin” at Coventry College until the final quarter when Sam Workman broke the College hearts with some sublime shooting which spearheaded a Griffins’ burst to take the points. Workman was the star of a 17-3 run inside five minutes to floor the Coventry side and keep alive Griffins’ hopes of landing the title. Five-man Cracovia Stratford put up a tremendous showing at Tamworth, but despite their heroics, they could not prevent Tigers from chalking up win number eight. It was 51-51 inside the second-half, when Neil Evans suddenly plundered three triples to open it up as the Stratford quintet ran out of steam. Tigers went on to win 90-70 but the bulk of their scoring came in those final fifteen minutes. 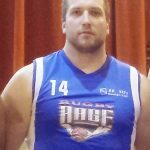 In Division Two Rugby Rage continued their unbeaten run with a 78-41 home win over Nuneaton Predators with Guntars Trabliks hitting 21 points, and Mike Kearsley was the star for Westwood Rhinos who whipped Tile Hill Trojans 3 56-27 at Hereward College. 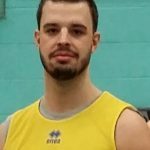 The odds were stacked against Arden Griffins when they lost their home court advantage against the unbeaten league leaders and then found one of their top scorers Luke Hatfield was unavailable for the match, billed by many as a potential title decider. With St Peter’s College unavailable they travelled to Hereward College, and were instantly buoyed by the news that Trojans were without three of their leading players so the scene was set for a thriller, and all the focus was on this one as it was the only fixture being played during the half-term break. After the initial exchanges brought very little, Trojans exploded and rattled in 13 points before Griffins responded, but there was no holding Ash Dickson as he converted virtually everything thrown to him and took his side to a 27-13 first-quarter lead. Griffins’ hot-shot Paul Roberts was being shackled by Trojans’ Alex Hernandez Rico and was finding the going tough as the Spaniard prevented him getting many shots away. When the second period began it was once again the home side in control, but suddenly the tide turned as Arden found the target to set Trojans floundering as scoring, that had been easy became difficult and the fight-back was on. Started by Jerry Sanghera and complemented by Sam Workman, Griffins piled on the pressure and brought it back to 41-37 just before half-time when the question around the court was who would be in charge after the break. Trojans opened well again as Mark Larner came good to glide home some graceful lay-ups. He and Dickson led the offensive line with Austin Dickson and Hernandez Rico providing the defensive tenacity as the tension and physicality mounted. Workman had to leave the court feeling under the weather, then Roberts finally found the net for only the second time, but it was Trojans who asserted themselves once more to take their lead to twenty at 71-51. Sanghera came into the picture again, but this time it was only a token as the men in red kept their cool. At the end, Roberts downed only his second triple, before Ben Okenwa wrapped things up for the home side. Hopefully, when the two do battle next time, they will both have a full squad, but the victory means that, barring a slip up against one of the other sides in the division – and they have to go to Aylesford yet, the fifth title in seven seasons could be just around the corner. Trojans – Ash Dickson 29, Larner 20, Okenwa 13, Austin Dickson 8, Hernandez Rico 6, Robinson 6, Bello 0. Griffins – Sanghera 20, Workman 16, Roberts 13, Forrest 8, Mirza 5, Quinn 2 Samuels 1, Cordon 0. 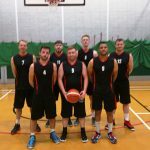 Aylesford Hawks soared back into contention for the league title with a brace of victories on the road and now sit in second place behind the unbeaten leaders Tile Hill Trojans 1. Hawks won both of their games, at Ernesford Eagles and Warwick China Red by thirty points and were in control from the first tip, particularly at Woodlands where Warwick China Red were no match for the five-time Champions, and the league’s oldest Club are desperate to make it six as they celebrate fifty years of local play. They raced into a massive match-winning 30-6 lead to leave the University students gasping, and the pace, set mainly by the flying Ricky Fennell was relentless. It understandably slowed after this initial burst, but China Red had no answer to him and colleagues Matt Glover and Calvin Moore – the trio responsible for 67 of the total which saw Hawks win 77-47. It was not quite the same at Bilton School where Ernesford, normally hosting at Grace Academy in Coventry were entertaining, and the game proved to be just that. Hawks, for once were pegged back after their quick-fire start and although Eagles could not match them, they gave a good account of themselves, trailing by four just ahead of the first break. But Hawks then took off and flew into an impressive 43-24 lead by half-time with Fennell again the driving force behind their offensive play. It continued after the interval with Aylesford having most things their own way and Fennell, who had slammed 34 against China Red, added a further eight three-pointers on his way to 38 to send Ernesford packing. The action contained twenty-one triples, four of them coming from Eagles’ debutant Suluman Charley to go with the three downed by their top scorer Ben Clarke in his 20 points. Eagles fared much better when they took on Cracovia Stratford and did everything right – until the last few minutes when they let slip a six-point lead to go down 62-65. Jamie Summers was consistent throughout for Stratford to finish on 32, but no points in the final five minutes cost Eagles an unexpected victory. 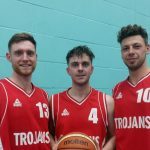 Tile Hill Trojans 1 had little trouble at JM Grizzlies where they grabbed a 100-49 win, despite being without their leading scorer Ash Dickson. Instead the honour of leading Trojans offense went to younger brother Austin and he excelled with a superb 34 point haul, 21 coming in the first half when Trojans raced into a 52-30 lead. After the interval they turned it on again to run up a 23-6 quarter and hit the hundred mark with the last scoring shot of the game. Leamington Spartans consolidated their mid-table position with a hard-earned 63-51 win at Trojans 2. There was little between the pair until the third quarter when Spartans offence clicked and they rattled in a 15-0 burst to seal the game. An even point spread saw Michael O’Neill, Adrian Ungereanu and Claudio Rossi equally sharing 36 and Ben Linnett leading Trojans with 16. Division Two strugglers Nuneaton and Trojans 3 without a game when their fixture was called off with a cricket net stuck across the Jubilee Centre court. Westwood Rhinos did make it though, and they crushed Team Rebels 50-29. 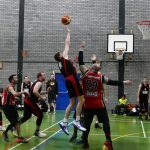 Arden Griffins, the nearest challengers to Coventry’s Tile Hill Trojans 1 had to pull out all the stops against Aylesford Hawks before winning 96-79 to maintain their title hopes. Hawks had skipper Ricky Fennell back in their ranks despite nursing a knee injury which had kept him out for two weeks, and he is hoping that the Christmas break will give it time to recover before the league matches resume. Fennell is key to good performances at Hawks, but the team were certainly no Christmas turkeys as they battled to contain Griffins’ hot-shots Paul Roberts and Luke Hatfield who rattled in nine three-pointers between them as the game ebbed and flowed. It was 20-19 at the end of the first quarter and 42-44 by the half-time interval. With nothing to choose between them Hawks went two up at the final break before Griffins turned on the taps and scored two to every one of their visitors with the result making the game look a little one-sided. But this was not the case. Griffins’ captain Jack Forrest said afterwards that it was a great game for the neutral and certainly not as comfortable as it looks. Hawks finally ran out of steam and managed just one point in the final two minutes, when Arden were on the charge. Hatfield led with 25 as Roberts added six triples in his 22, with George Pool landing 20 for Hawks. Meanwhile, leaders Trojans met up with Leamington Spartans for the first time and put their hosts to the sword with a resounding 90-47 win. The league’s newest club struggled from the off as Trojans, with three national league players in their ranks stormed out of the blocks to lead 27-10, and their tough defensive play coupled with an impressive offence took them to 46-19 by half-time. Spartans gave as good as they got in the third quarter before Trojans took the initiative in the last ten minutes to pull away again. Austin Dickson led for the Coventry side with 26 points and Richard Onions made 25 as former Trojan Michael O’Neill led Spartans with 14. Coventry College finished one short of the hundred against Warwick China Red with Vaidas Cerkunovas starring once again landing 40 of their points. It was a tough ask for the University students to compete with the experienced Coventry side and it showed as the home side won all four quarters, virtually doubling their opponents’ score in each one before going onto land the points 99-49. Both Coventry Tornadoes and Tamworth Tigers enjoyed home victories, with Tornadoes leaving JM Grizzles languishing at the bottom of the league still searching for their first win. Grizzlies are not being helped by their inability to score free-shots and their 7 from 21 attempts was a poor return as Tornadoes landed two-thirds of their shots to seal a 75-60 win with a flurry of baskets in the last four minutes. Michael Stokes led on 25 with Tom Anderson on 23 and Ashley Dawson headed the Grizzlies’ list with 14. Rugby Rage head to the Christmas break unbeaten at the top of Division Two and their latest victim were Nuneaton Predators who were no match for their guests, as were Westwood Rhinos who fell to Team Rebels 48-70.